PolyU Design’s exhibition stand design won the eyes of the red dot award judging panel and was awarded the prestigious red dot communication award. The exhibition was set up at the annual Business of Design Week 2009’s Inspiration Hall. The brief was to build a space that is: 1) Highly efficient in order to encapsulate the variety of programs and initiatives at the School; and 2) be able to highlight individual designs, and entice visitors to stay and go through all exhibits at the stand. Through a rigorous tender process, Oval Design provided a solution that meet the requirements and also create a positive visiting experience. Dennis Wong of Oval Design was the Creative Director for the project and a proud graduate of PolyU Design. He won the red dot communication design award with this stand design, together with the Macau Pavilion design at the Shanghai World Expo 2010. The two winning projects can be viewed online at www.red-dot.de from December 9, 2010 through January 9, 2011. 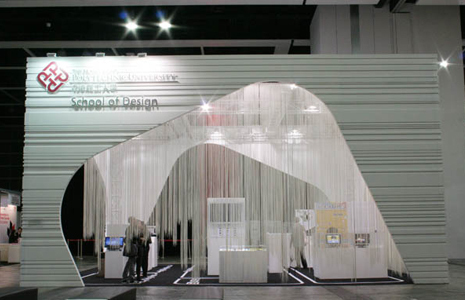 PolyU Design will be at the Inspiration Hall again this year from 2-4 Dec. Come share our latest brainwaves on design!